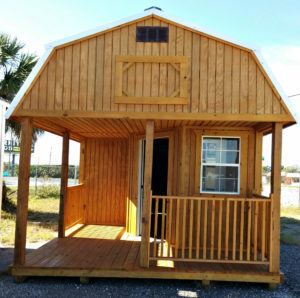 I was recently doing some research for my next Blog post and came across an article about these great Tiny Homes for retirees. In my infinite curiosity I decided to take a look at what this was all about and what they were promoting. They were all great Tiny Homes, but the price tags? To me, this simply defeats the concept of becoming minimal, living small, and the idea of affordability without a mortgage. 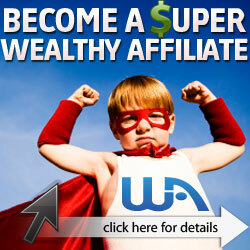 We all want to retire someday and live comfortably, and in the way that we choose. Many of us aren’t looking for a super large house with new cars and a boat in the driveway. Well, maybe some, but not everyone! It’s not something that my wife and I are looking for or wanting in life . I also found that according to a 2015 survey by a Tiny Home website that 30% of Retirees living Tiny are between the ages of 51 and 70. Our focus begins with reducing our clutter and the material things that we don’t want or need. My wife Cheri addresses much of that in her Blog. We definitely do not need a large house where we end up only adding things to it along with a huge mortgage. We also aren’t interested in a small or Tiny House that we cant reasonably afford with those bells and whistles attached to it. There is nothing wrong with those who want that, but its just not for us! Many retirees may have the extra cash or savings to sink money into these houses and indeed end up with no mortgage at all. What about the ones that don’t have cash available or a hefty retirement package? I hope to give you some ideas about how to do that and not having a never ending mortgage. The average cost to build your own can start around $23,000 or less. It really depends on what materials you use, your skill level, and the things you want in it. If you have someone build it for you, the prices can begin at around $45,000 and up. My wife and I began our journey by looking at THOW’s ( Tiny Houses on Wheels). The builders that we met are great people and great builders doing quality work. We changed our minds because we were not interested in anything on wheels and the PRICE TAGS! Almost all builders want full payment for the Tiny House they build for you. Nothing wrong with being in business and making a profit, however, many people don’t have that kind of spare change laying around. It can also be difficult to find a bank to finance one. That’s problem #2! We decided that we wanted to create our own and in a style that we liked. During our searches we found some Mennonite built buildings that are mostly designed for storage or backyard kids playhouses. No, Not that small! We all know that the Mennonite and Amish have the construction quality and techniques that we look for in a building. Take a look at what we found Here. 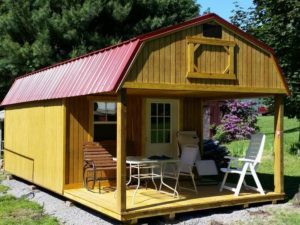 You can find a simple storage building or a Lofted or Un-lofted Playhouse barns as large as 14 feet wide and 40 feet long with delivery and setup within a certain radius of the nearest dealer. 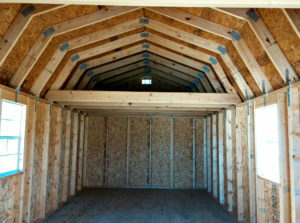 They all come with a choice of doors, windows, metal or shingled roof, siding and paint or stain colors. The benefit in being affordable is the fact that you can purchase them outright or rent to own over a three year period. We chose the 14 x 40 Deluxe Lofted Playhouse with full porch and metal roof when the time comes for us to purchase and have it moved. We really don’t have much of a desire to climb stairs so we will probably opt to use the lofts for storage space. This was a much better option for us because it gives us the option of finishing the inside ourselves with a floor plan that we choose. We also want a vintage look inside the cabin which can allow us to use recycled materials where we want. Of course, because of safety reasons and permitting, we will need to have a licensed electrician for the electrical hookup. You can see the examples in the photos below. Due to the proximity of our property in Tennessee we have chosen a local dealer to buy our cabin from and have it moved and setup. With some steady work and a little elbow grease we could very well have our cabin in the woods livable within two to three weeks. If all goes well, we shouldn’t have a mortgage or much of one anyway! We can spend that extra cash adding chicken coops and gardens and enjoying our life at the top of our mountain! You may have been wondering where I have been? Well, I have really been wanting to create a new blog post. Something I can share with you to help create that homestead of yours! As with many things, I do have other commitments and a job besides blogging! And Yes, those holidays like Thanksgiving and Christmas are upon us! While I am working on creating another topic or two, I wanted to take this opportunity to wish everyone a Happy and Joyous Holiday season! Please feel free to Like our Facebook page or Follow along on Twitter using the widgets! We would very much appreciate it!